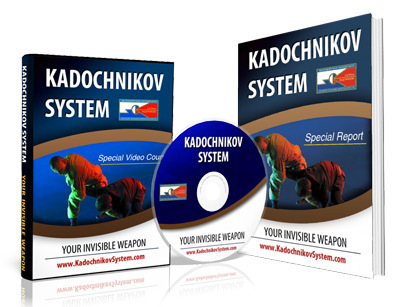 Alexey Alexeyevich Kadochnikov is the author of the Kadochnicov Systema. He points out that his course is not just a type of russian hand-to-hand combat but the private safeguarding technique. The private safeguarding technique is meant to enrich the actual life experience of a man who can call himself a person of the safe type. Considering this the system of survival is not any more a separate form of activity it has characteristics of applied structure and can’t be separated from the everyday life. Thus a person of the safe type who is familiar with the safeguarding technique is a disciplined man with a sense of responsibility able to analyze difficult situations instantly, make right and quick decisions. He or she can be quite adequate from legal point of view in their reaction to the abnormal behavior of a delinquent bringing down the risk of unexpected situations. The private safeguarding technique meaning the security of a person from the factors that endanger his private interests and needs has lots of variants. It is related to the fact that the person of the safe type is a biosocial system that can express a person as a part of the society and at the same time a person as a human being that exists in limited surrounding. A crime as a notion of wrong-doing has nothing to do with nationality. Thus we can regard crime as an international concept in our country. The opinion that the social work of the Russian Orthodox Church has significant positive effect in preventing the deviant behavior in the process of reducing crime is quite true. When speaking the law and the State a man should go through deep changes. He should stop regarding it as something “external”. He should start to see its “inner” moral and spiritual side. It only looks like the law refers to external notions such as body and space. Actually its field of activity is a human soul. The law serves as an objective value. There is no State outside the spiritual state of each single soul. This is impossible. The state status of people is first of all their spiritual state. This is an evendown truth that there is no law and no State without great number of individuals having legal awareness and connected over the communication. This defines the connection between the State and the whole moral culture of the people especially it refers to the relationships with the church. The religion in itself claims to administer all matters and relationships. It’s looking for and always finding the highest word and the last word. It shows a human something that makes his life real and in this way his every action finds meaning and the last consecration. If the religion takes hold of an individual soul defining its nature and destiny it can’t pass by the law and the State as they have not just external automatic life but inner, spiritual and moral life. If the religion plants in a man’s soul some special blissful state called by the church “the kingdom of God” due to this it starts up all the powers of personal spirit: the feeling the patriotism is bases on, the will sustaining the right of the individual for the spiritual autonomy. The legal awareness and the kingdom of God live and work in the same moral field. That’s why this legal conception of the person of the safe type can’t be regarded separately. It is a kind of projection of the legal culture of the society, the result of the co-authorship and cooperation of people. In the process of this cooperation the social relations bring up a system of various social features, merits, qualities that further manifest themselves in the human’s behavior. The person of the safe type is an active part of the social relationships. The social experience is usually got through the inner world of a human being. This inner world expresses his relations and other things happening to him. According to this conception of the person of the safe type it is important that the legal culture of the society is the product of social and legal activity of a man from the one hand and from the other it is a base for performing this activity and creation of individual and legal culture. Thus the legal conception of improvement of this safe type person is the basis for creation of the legal state of the society. At the same time it is an extension and type of the person’s legal development that is expressed in his or hers level of lawful behavior. The legal culture of the society and the person of the safe type are the categories of the universal values, the great achievements of the progressive mankind.